Note: This feature uses an API (application program interface) that Google stopped supporting in late 2015. That means the feed widget is no longer reliable: It may work one day and not another. Select the page where you want to add the feed, in the left toolbar, click the Blog/RSS button, and an example blog is added to the page. Double-click the example blog window to open the Settings. 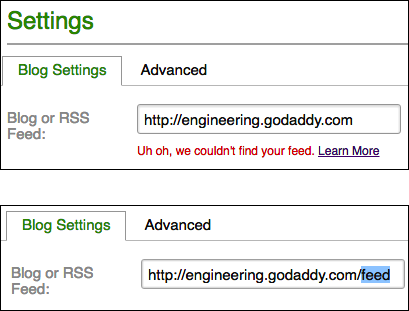 Replace the sample address in the Blog or RSS Feed field with that of the blog you want displayed. Note: If you enter the blog’s top-level address, such as xxxx.com, you may see an alert message below the field. Adding/feed/ at the end usually fixes that. # of listings Move the bar to select how many posts you want to see on your site. Layout Select how you want the posts to look on your site. Optional tab Click the tab to add or edit other effects such as Background color, Border, and Shadow. Click Save and the window closes.